Merry Christmas!!!! trace and lucas have been very good this year, so santa came to visit!! he brought lots of goodies for the boys, probably too many! but hey, spoil them while they are young, right? :o) lucas woke us up about 6:30 on christmas morning. i fixed him a bottle and put him in bed with me and nate. 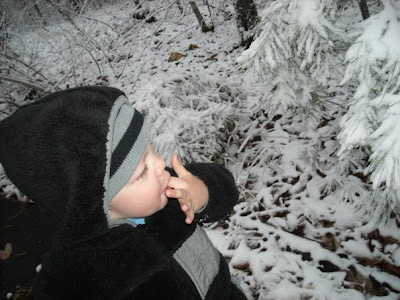 a few minutes later, trace woke up calling MAAAMMMAAA at the top of his lungs! 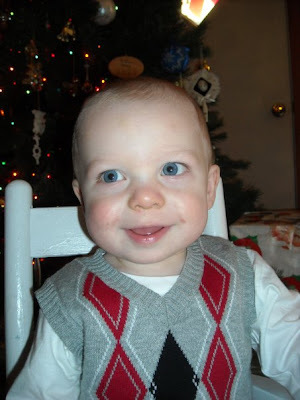 the minute i opened his door, it was non-stop santa talk! did santa come? is he here? did he leave us presents? santa presents santa presents santa presents! that's all i heard! so we put lucas on the floor to crawl into the living room, and instead he went strait to trace's room where he knew his old toys were. 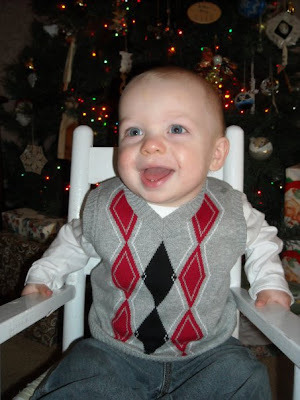 it's his first christmas, and obviously he's too young to understand any of it! 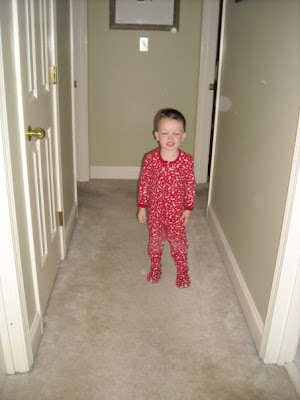 i got this picture of trace coming down the hallway. poor thing looks half asleep! 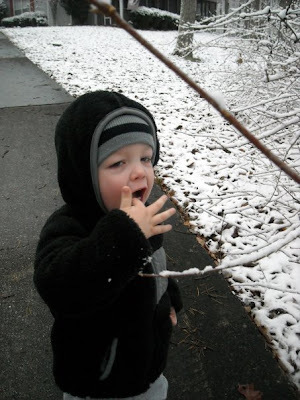 but he couldn't get to the tree fast enough, he was so excited! and lucas, we got him steered in the right direction, and then he just stopped in the kitchen. 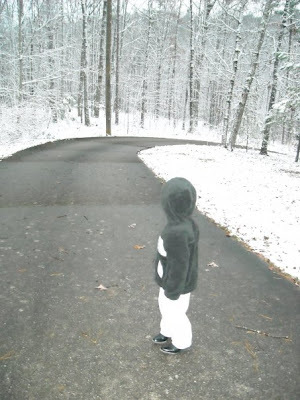 he did not understand why we wanted him to follow his bubba to see if santa had come! he was awake, i promise! just snapped the pic with his eyes closed! 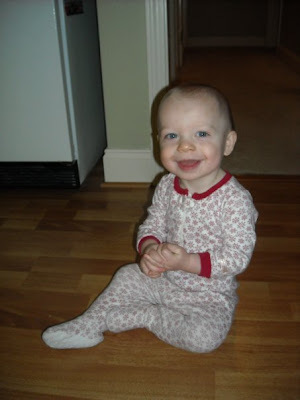 and here's lucas, stopping in the kitchen- all smiles! trace was overwhelmed with all the stuff under the tree. he reached strait for his stocking and started pulling out his treats! 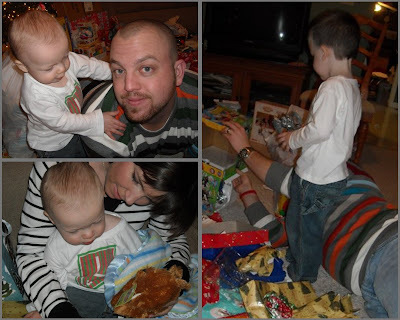 he got big boy scooby doo undies, a few toys, some m&m's, and a life-saver book in his stocking. lucas got blocks and a few small toys. 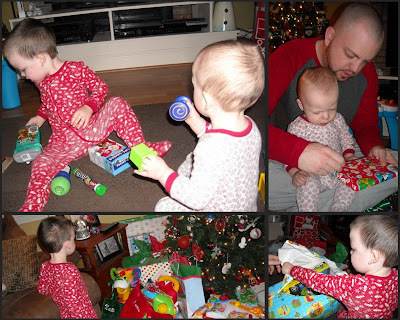 the boys had fun opening their gifts. then nate and i opened a few... we had both gone shopping and got some great deals earlier in december, so that was basically our christmas to each other. nate opening his new pictures to go on his desk at work. he was showing them to trace! opening presents is so much fun! trace really got into it! nate had to help lucas. so i wasn't gonna tell everyone this, well, all 3 of you who read my blog probably already know! 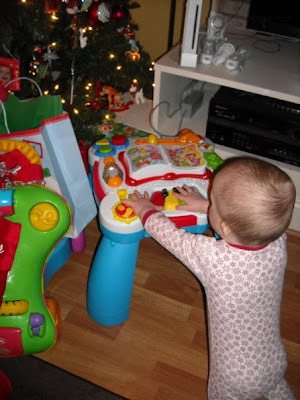 but for lucas for christmas, we got down 3-4 large standing toys from the attic, that we saved from trace. lucas is so small and really has no idea what this present thing is all about! 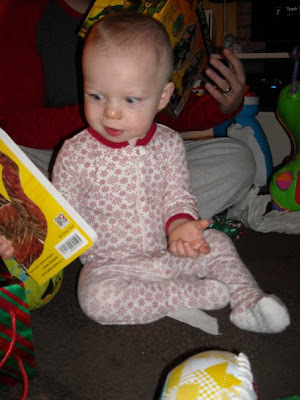 so we got him a book and some balls to open, but other than that, he got hand-me-downs from trace! (you may think i'm being cheap, in a way, i was. but at the same time... makes good sense to me!) anyways. 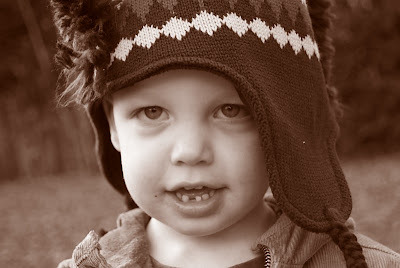 back to his sweet face in that pic... i LOVE it! ;) here's lucas playing with his new activity table. trace loves to read. and he loves mickey! so we got him a "look and find" mickey book. he also got a ninja turtle on a 4 wheeler, some new pj's and a new batman shirt, a "scooby dooby mooby" (which is his MOST FAV thing ever!) and this thomas the train set with a track. 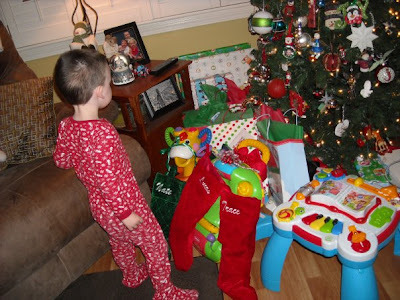 he would tear open his gifts, get excited for a minute, then ask where the next present was. it was funny! 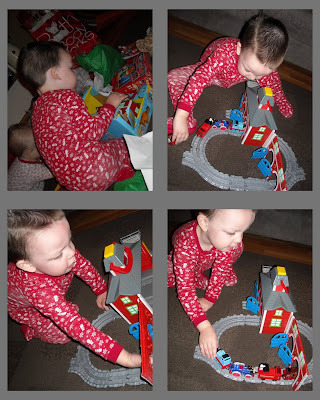 here is trace playing with his new train. can you believe he hasn't even had it a week, and already a few pieces of the track have gone missing? I CAN! 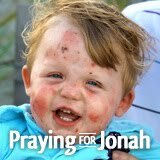 i'm sure they are deep down at the bottom of his toy box, probably never to be found again! so after everything was open, i saw 2 presents still under the tree! and they were for me, from nate. he knew what i wanted, and he came through! if any of you DON'T know, nate is a VERY talented artist. he can draw like nobody's business. 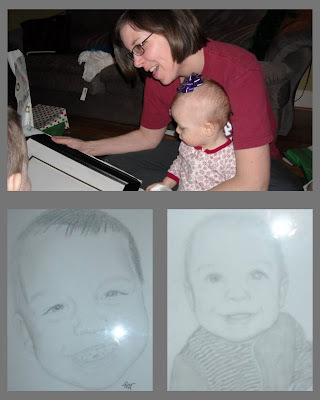 he has drawn a picture of trace for me, and he knew i've been wanting one of lucas! 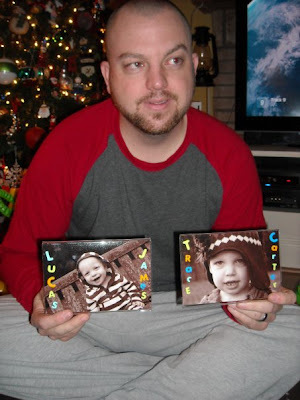 well SURPRISE, i got one of lucas, to match the older one of trace, AND i got a new one of trace. i LOVE them both!!! 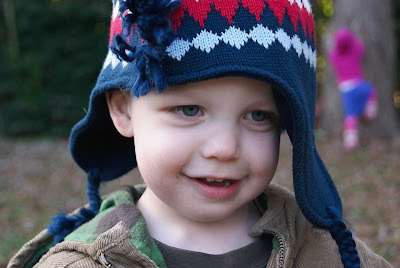 he's going to do 1 more of lucas, so they will match and we can hang them together! i can't wait! don't you LOVE my new drawings? i do!! 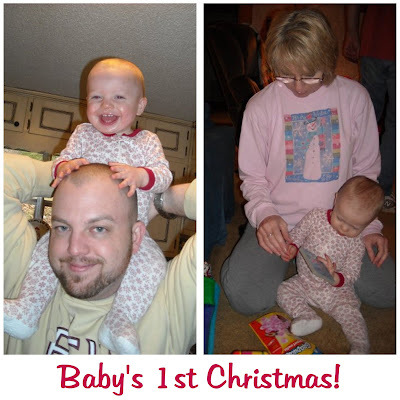 so that was christmas morning at our house! 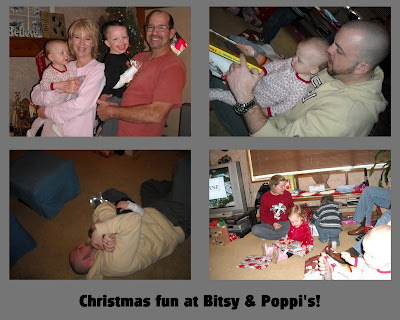 next we went to bitsy and poppi's for brunch and presents! we had a DELISH spread for brunch... including but not limited to: fruit and sweet fruit dip, ham biscuits, MONKEY BREAD (my FAV! ), egg and cheese squares, bread pudding, grape salad, sausage and cheese crosaints, and i can't remember what else! i wish i would have taken a few pics of the food, but i was way too hungry to do that. ha! after we had all stuffed ourselves, we opened presents! again, the kids got more things than they will ever need! 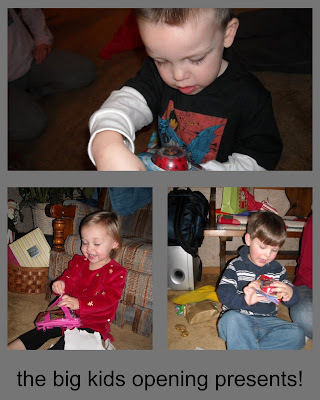 they were so cute to watch, caden started off by squealing with delight over the spiderman yo-yo we put in his stocking. you'd have thought it was a million bucks! 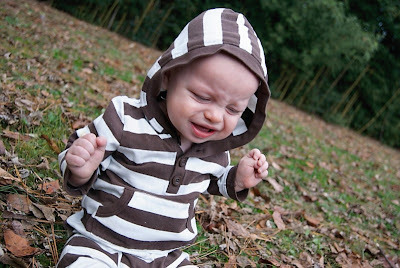 again, lucas didn't really know what was going on. but he had fun anyways! bitsy helped him open his gifts in stocking. and later, he rode on daddy's shoulders! the kids got SO many presents, from everyone! 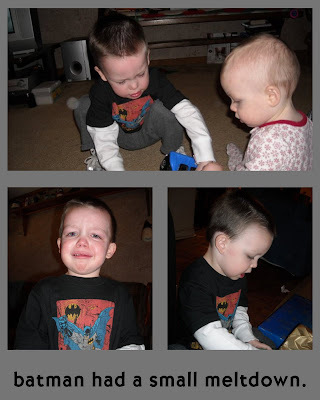 it was kind of hard this year, to explain to trace that christmas is really all about jesus. he knows it is baby jesus' birthday, but he also knows about santa. 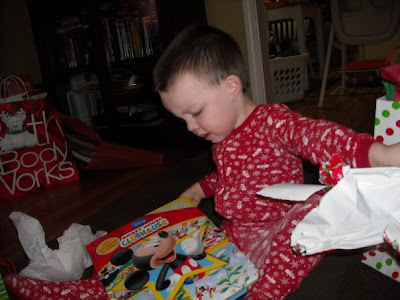 it's just something that we will continue to teach him as he gets older, that santa and presents are just part of the fun that represent christmas, but it's not what christmas is all about! i think next year i want to start the tradition of baking a birthday cake for jesus on christmas! won't that be fun? 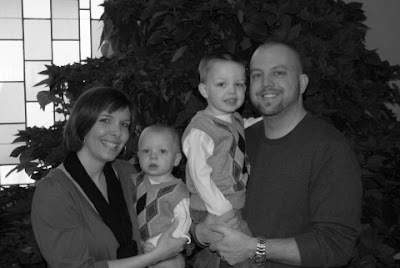 and of course, one of my favs, me and my boys!! i really hope you all had a great christmas! we definitely did! "but the angel said to them, i bring you good news, of great joy which will be for all the people. 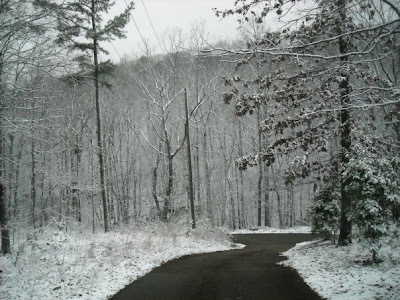 today in the town of david, a savior has been born to you, he is christ the lord. this will be a sign to you, you will find a baby wrapped in cloths, and lying in a manger. suddenly a great company of the heavenly host appeared with the angel, praising god and saying, "glory to god in the highest, and on earth, peace and goodwill to men on whom his favor rests." one last thought on christmas. it's something i hit on a few days ago on my facebook status. 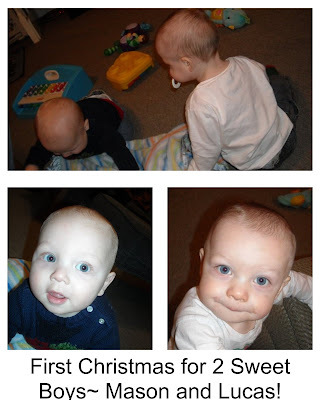 there is just something about being a mom to 2 young boys that REALLY makes christmas special. i try and put myself in mary's shoes. it is so hard! i just can't imagine how she did what she did... from riding on a donkey 9 months pregnant, to finding a place to give birth OUTSIDE! 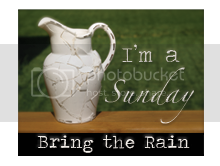 then watching her sweet and perfect son grow up and live a sin-less life, only to die the harshest death, on a cross! to watch him die for all of mankind, for MY sins, so that one day i can live forever in eternity with jesus himself! 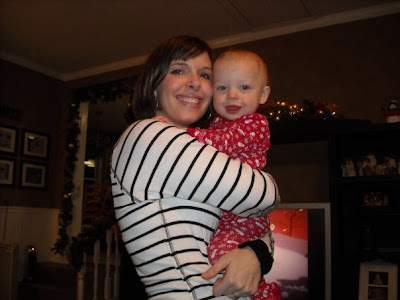 wow, i'm so thankful she was obedient, b/c i'm not so sure i could have been! now THAT'S what christmas is all about folks! we have a tradition of going to meme and grandaddy's (nate's parents) on christmas eve. we went over there around noon (everyone but me, i had to work til 2, but that's another story!) and enjoyed a yummy traditional meal- fried turkey, potatoes, rolls, you know the drill. with punch bowl cake and cheese danish for dessert- YUMMMY! 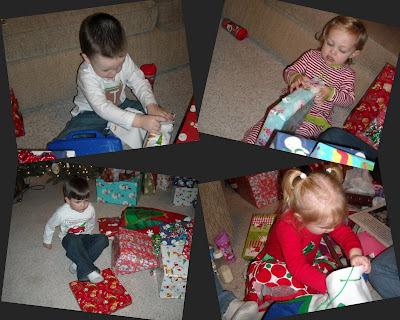 then the kids were so excited they could hardly wait to start ripping open the presents! 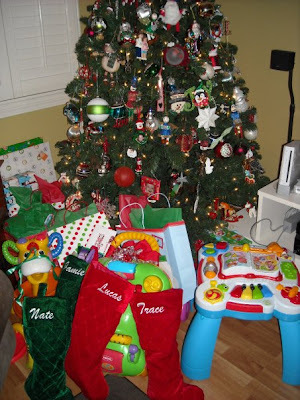 there were more presents than you could imagine, yet it seemed to only take them about 2 minutes to open everything. ha! then it was ooohhs and aaahhhs and then open this mommy! it needs batteries daddy! help me! we had a blast. we got more goodies than we should have. the kids had a ball! after meme and g-daddy's, we went to church for the candle light communion service. the kids went in their (matching of course) pj's. 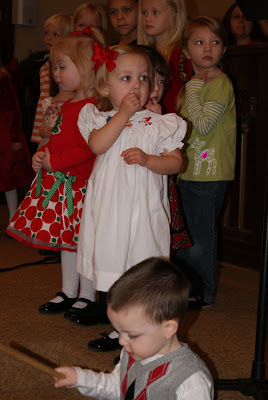 since nate led the carols and ran the sound, it left me to care for the babies. umm, trying to keep them quiet wasn't very easy. luckily i had help from the grandparents and we all survived, and noone caught anything on fire. (considering my 2 year old was holding a candle, i call that a huge accomplishment!!) 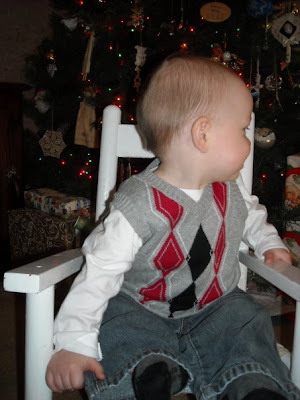 we didn't take any pics at church, but hope you enjoy the pictures from our christmas at meme and grandaddy's! opening presents!! so much fun! 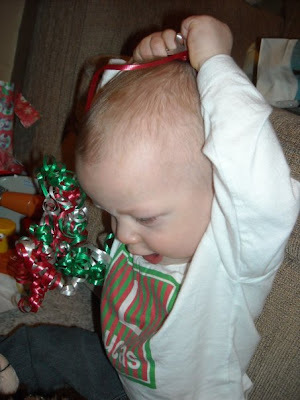 like most babies, lucas enjoyed the bows and ribbons more than the presents themselves! 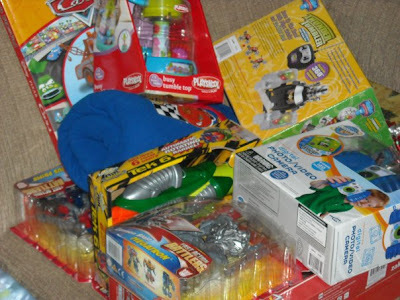 just a few of the wonderful toys the boys got! i love this next one. 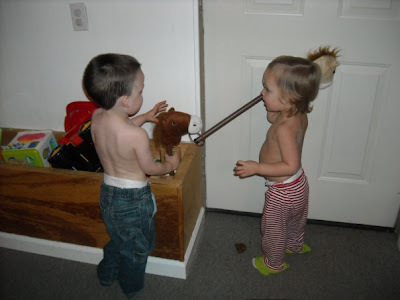 the youngest cousins are so cute together! 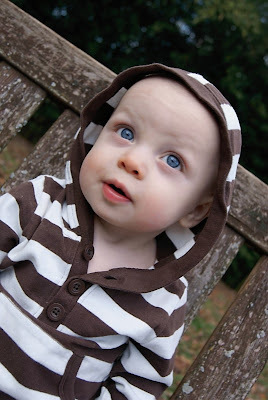 love their big blue eyes! 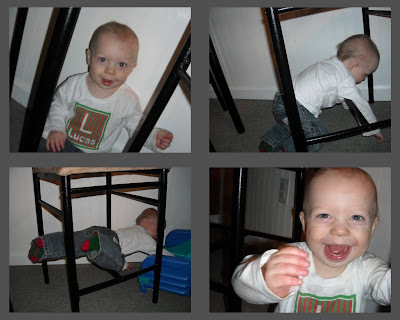 these pictures don't do justice to how much fun lucas had under meme's tall table and chairs. he acted like it was his own little obstacle course! he was cracking me up climbing in and out, over and under. the one of him in mid climb with nothing touching the floor still cracks me up! he had a ball! 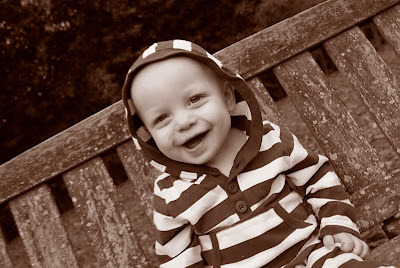 ok, well maybe the last pic shows you how much fun he had! look at that big smile! 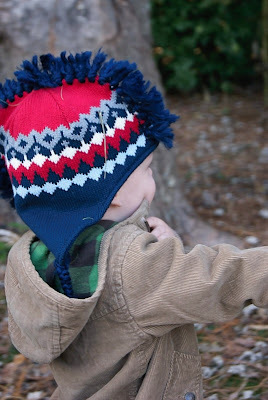 and i LOVE LOVE LOVE this next one! usually i am so busy taking the pics, i don't get in any of them. but nate took some this year, and i had him take one of me and lucas. don't you love it! 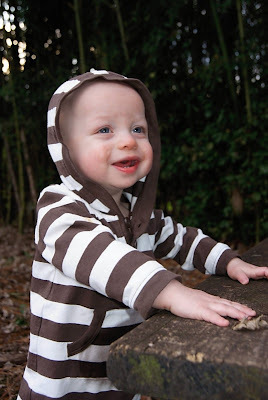 oh i love my sweet baby boy! 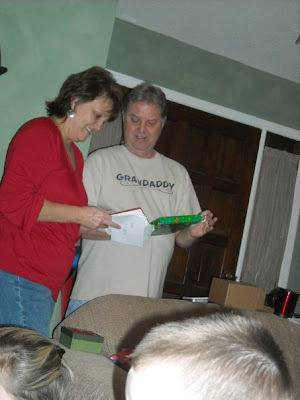 and last is a picture of some of the sweet presents from meme and grandaddy. 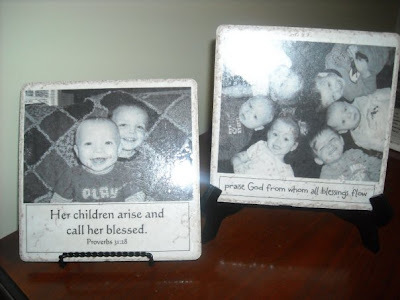 meme made these tiles for us that had the kids pictures on it. i LOVE THEM! she gave us 2 more, as well as a blanket with a ton of pictures of trace and lucas from 09, and a photo album of several pictures she has taken of the kids this year. i love personal gifts like that. definitely something we will cherish forever! 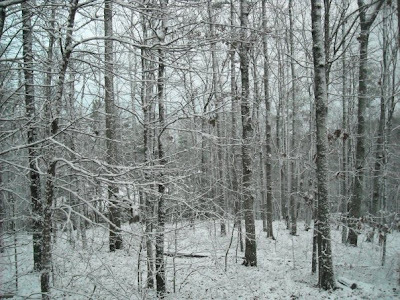 what a wonderful christmas eve! 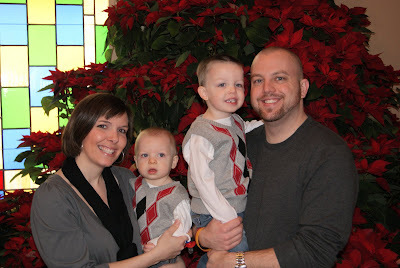 after the candle light service we went home, got the kids ready for bed, and then santa came! come, they told me. pa rum pum pum pum. a newborn king to see. pa rum pum pum pum. our finest gifts to bring. pa rum pum pum pum. to lay before the king. pa rum pum pum pum. rum pum pum pum. rum pum pum pum. so to honor him. pa rum pum pum pum. little baby. pa rum pum pum pum. i am a poor boy too. pa rum pum pum pum. i have no gift to bring. pa rum pum pum pum. that's fit to give the king. pa rum pum pum pum. shall i play for you? pa rum pum pum pum. mary nodded. pa rum pum pum pum. the ox and lamb kept time. pa rum pum pum pum. 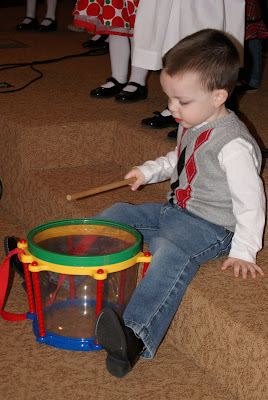 i played my drum for him. pa rum pum pum pum. i played my best for him. pa rum pum pum pum. rum pum pum rum pum pum pum. 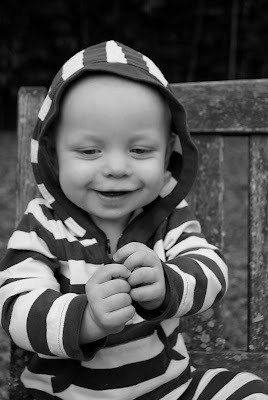 then he smiled at me. pa rum pum pum pum. 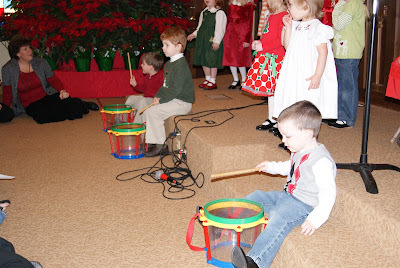 the youngest kids choir sang and played lil drummer boy at church on sunday. 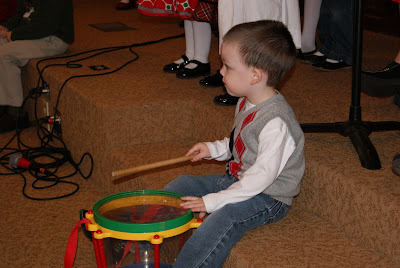 trace was one of the lil drummer boys! he played his little heart out too, and i swear to you, he played on beat the whole time. ask anyone who was there! 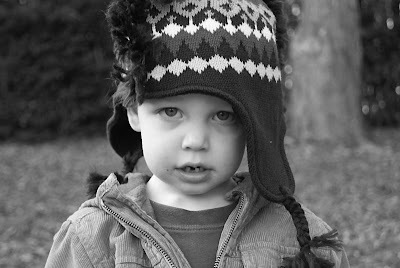 this boy of mine is gonna be just like his daddy. i know i've said it before, but it's true! he has an ear for music that is unbelievable for a 2 year old! 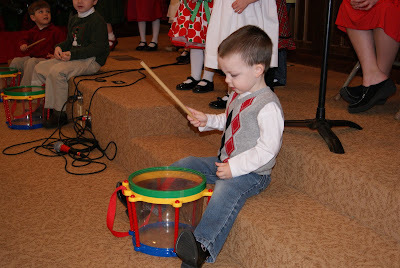 he was the cutest little drummer boy. made his mama so so proud! and i know he made jesus proud too! he moved me to tears! i love him! 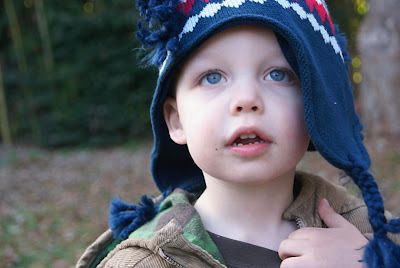 my sis got a new camera and was trying it out on trace and lucas! 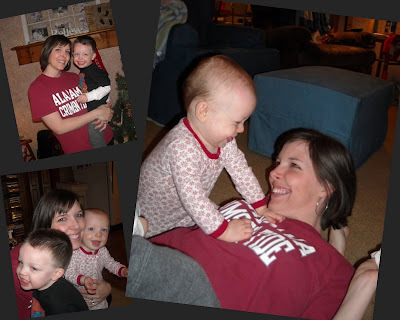 she took these pics at thanksgiving, but i forgot all about them. until now! i'm so glad i found them. 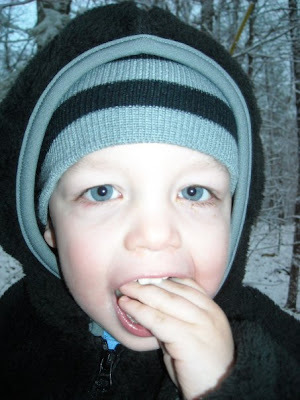 enjoy the beautiful blue-eyed baby boys that i am proud to call 2 of my best blessings in life! this has got to be my most favorite christmas decoration EVER! and boy is it a long time coming!! we love love love willow tree. we probably have 20+ of their collectables. when we saw their nativity, it is something we really wanted. however, it's quite expensive to just go out and buy. so we have added to the pieces since we have been married... and i think it is finally complete! there may be a new animal that we can add, but for the most part, we have it all. and i LOVE it! it sits on top of our mantel, above the tv. (can you see the wii remote sensor bar in the pic? ha!) the plaque above it is something that we always have hanging there. but it looks so much like it goes with the nativity! 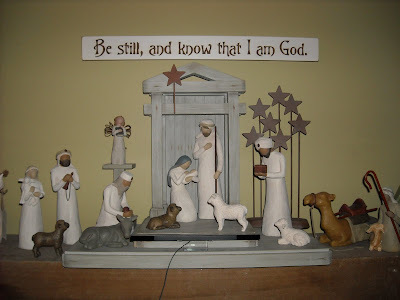 it's always a good remember, at christmas time and always, "be still, and know that i am god!"